Whether sudden or expected, the loss of a loved one is never easy. 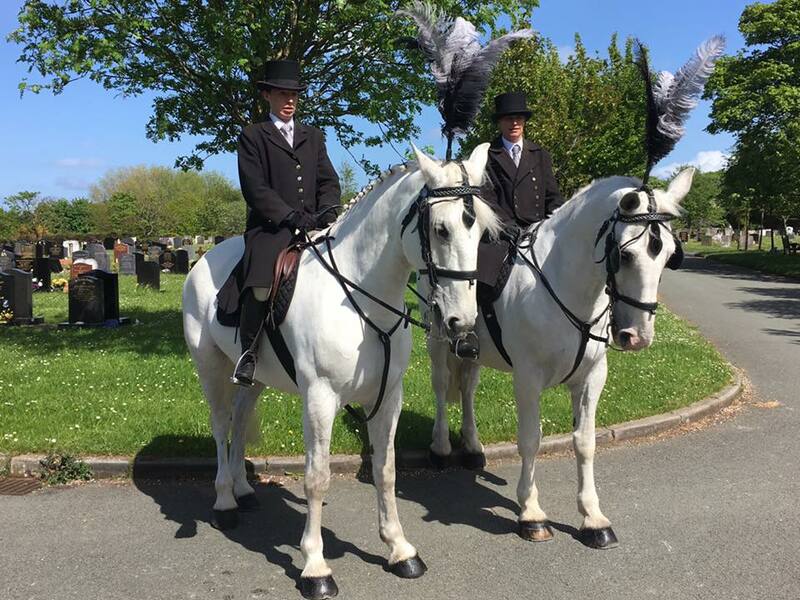 We specialise in providing a comprehensive and professional horse-drawn hearse carriage hire service throughout Lancashire, Cheshire, Merseyside and the North West. 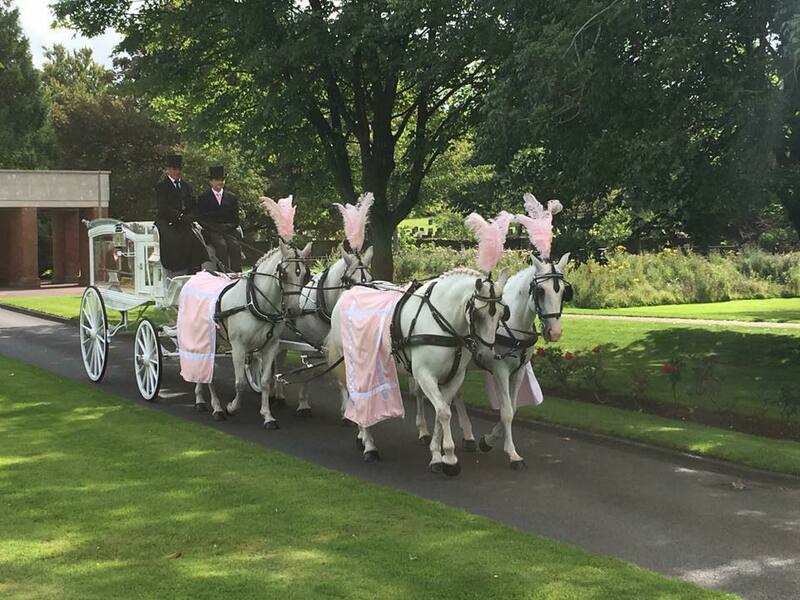 As a local business with years of experience in assisting funeral directors with horse drawn funerals, you can count on us to provide a memorable and elegant final send-off. Elegant Carriages have a fleet of purpose-built glass-sided funeral hearse for horse drawn funerals. Available in Black, White, Silver and Rainbow each carriage is meticulously inspected prior to the day of the funeral. Decoration can be added (as long as it doesn't affect operation) to personalise the carriage in memory of the deceased. We will be more than happy to source suitable decorations or they can be provisioned by the family. 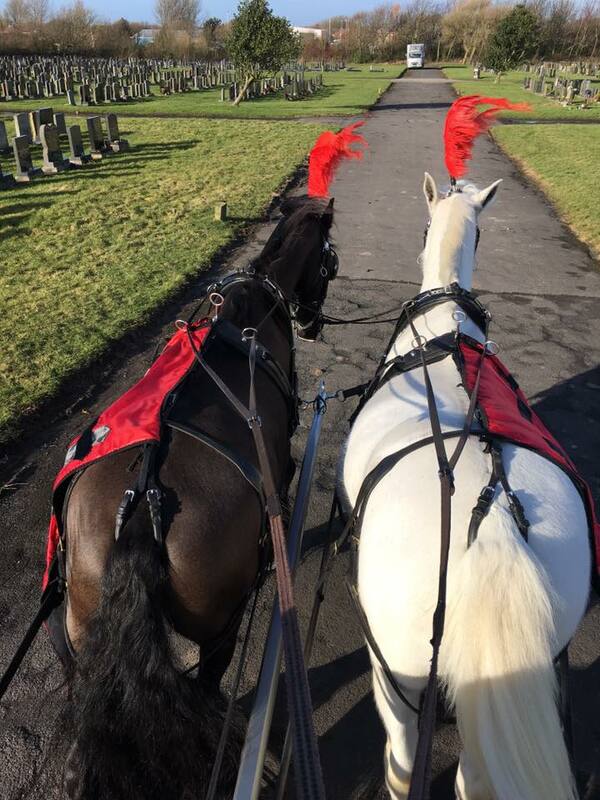 The carriage can be pulled by either a pair (2) or a team of 4-6 horses. The family can choose from exclusively white Irish Sport horses or black Friesian horses to match or contrast with the carriage, or you can have a "domino" team which is a mixture of both. The horses will be immaculately turned out with matching drapes and plumes, available in a large variety of colours and patterns. We also cater for special requests such as national flags or football clubs. As all of our drapes and plumes are manufactured in house, we can accommodate any request with sufficient notice. The hire includes two fully-qualified coachmen who will also be dressed in formal attire, top hat included. If required, we can provide an outrider to accompany the hearse on horseback. We additionally have two mourner's carriages (available in black or white) which seats up to 5 people. Alternatively, we can provide a modern luxury vehicle for mourners to follow in the procession. We are also proud to announce our Rainbow Hearse- the only horse drawn Rainbow hearse in the UK and exclusively available to Elegant Carriages}. You can read more about it HERE. No two person is the same, and neither should their funerals. 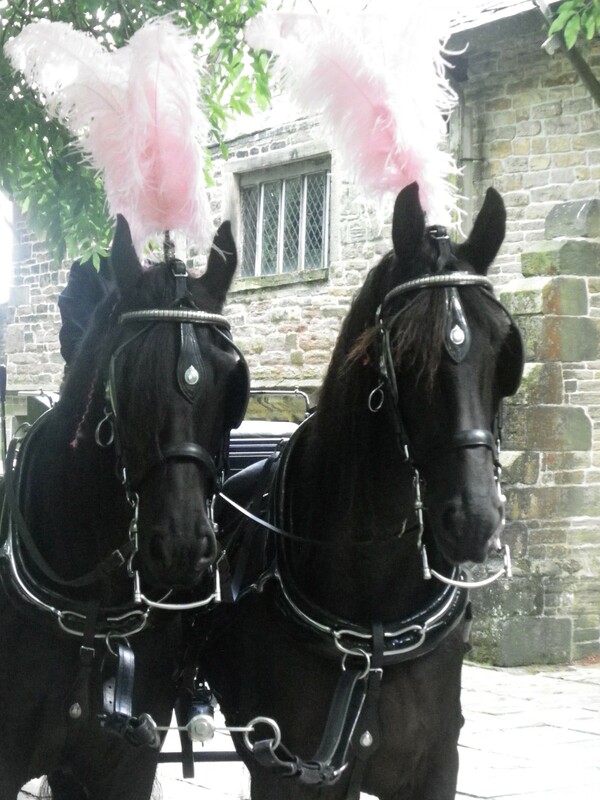 Each of our horse drawn funeral hearse hire is tailored to the bespoke need of the client. In most cases, we can liaise directly with the funeral director to arrange the details of the day. However, any client input is more than welcome. Our sympathetic attitude and attention to detail has earned us an outstanding reputation in the industry. Although we predominantly service the North West, we can travel further afield if required. All of our horses and staff are highly professional- unless there is a torrential amount of rainfall or the rain causing unsafe conditions, our team will proceed with the day as planned. Our mourner's carriages have convertible roofs which can be put up in seconds to keep the mourners dry. In the case of adverse weather, our coachmen will make a decision on the day whether to proceed with operation. Do I need a permit to hire a horse-drawn carriage? Not usually. Your funeral director should discuss this part with you, including deciding the route and method of transports available. All of our coachmen are fully trained and licensed to operate (or drive, to be technical) a horse-drawn carriage wagon. Are the horses OK with heavy traffic? Absolutely. Our team of horses are experienced in working in different environments, from rural country roads to navigating busy city streets. They are not spooked easily by road traffic. How early do I need to book? We appreciate that while you can pre-plan a funeral, you cannot book in advance like with other events. 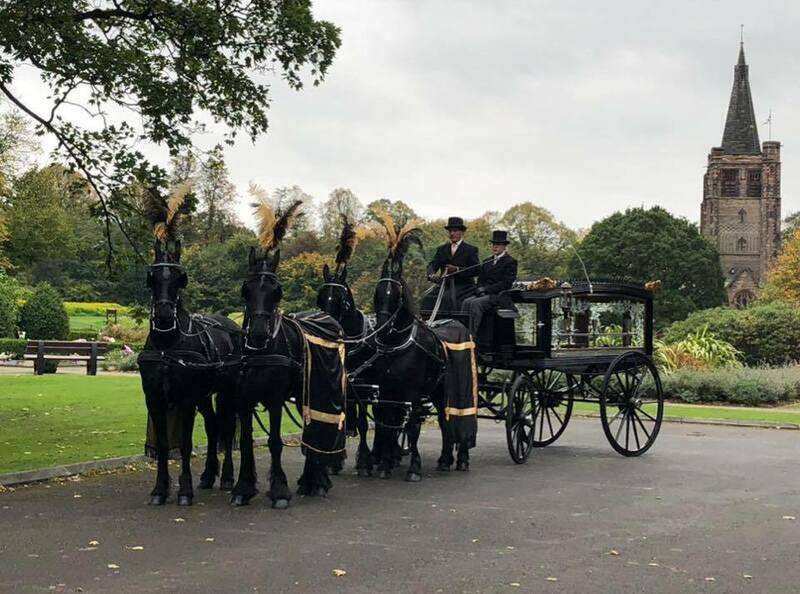 Elegant Carriages are here for you when the unexpected happens; our horse-drawn funeral hearses can be available to hire with short notice (subject to availability). 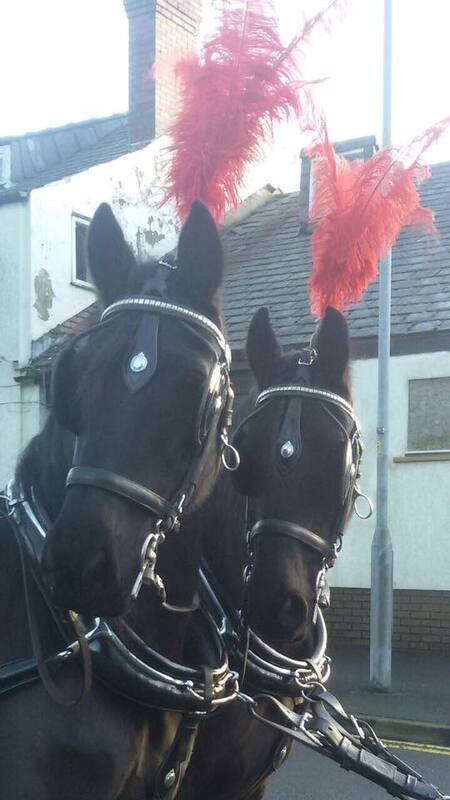 Our carriages and horses will always be immaculately presented with no compromise regardless of the notice given.